I know the holidays are on everyone’s mind right now. But you know what comes after Christmas? The New Year! And the start of a new year is the perfect time to organize! We always take a trip to IKEA in January to help with our New Year organization. But you don’t have to use IKEA’s products as-is. For inspiration, take a look at these 20 Clever IKEA Storage Hacks! In most cases, IKEA products are perfectly fine the way they were designed. But sometimes I wish there were other colors or styles available. That’s where IKEA storage hacks like these come in! You may remember that I did a simple style change hack with my IKEA Hemnes shoe cabinet a while back. Some of the IKEA storage hacks in this roundup are simple like that one. Others are more complex DIYs. But all of them end up with you having beautiful, functional storage products for your home! Check them out, and remember, you’re not limited by what you see here. 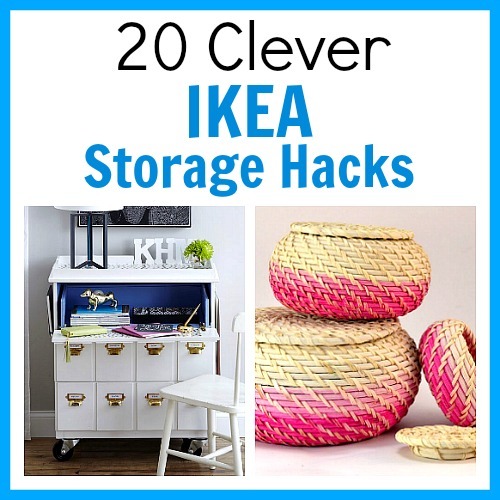 Virtually any IKEA storage, or storage from any store, can be “hacked” to turn it into something prettier, or more useful! Don’t have an IKEA near you? IKEA actually sells some of their products on Amazon! Most of the items are smaller, but they do have some of their furniture available. And some of their products are available via Prime! Depending on what you’re looking for, you may find buying it from Amazon gives a better deal than getting it from IKEA’s website and paying the shipping fees. Have you ever done a DIY project to made an IKEA product into something new?